Values hit record highs in 2018, though some buyers and developers are showing 'price fatigue.' But apparently not the buyer of a penthouse under construction with a price of $2.9 million. Portland’s condominium market reached a fever pitch in 2018, with new and existing units selling faster than ever before – and at higher prices. But analysts said the market also showed some signs of slowing down at a time when hundreds of new units are either in the planning stage or under construction. In many ways, 2018 was a record year for the condo market in Portland, according to Elise Loschiavo, associate broker at Vitalius Real Estate Group in Portland. Loschiavo recently authored a report on the city’s condo market. 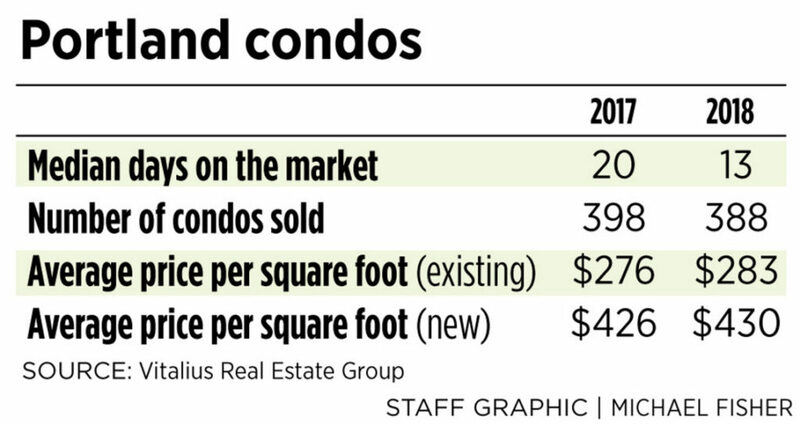 Condo prices increased by about 6 percent in Portland from 2017, which also was a record-setting year for the city’s condo market. 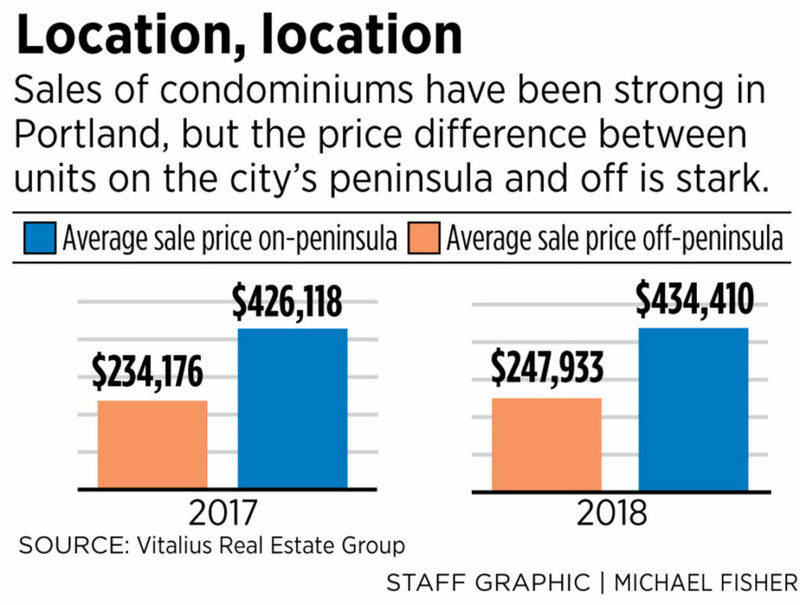 The average sale price for a condo on the Portland peninsula was $434,410 in 2018, while the average price off-peninsula was $247,933. The citywide average condo price per square foot edged upward from $426 in 2017 to $430 in 2018, while the median days on market for a condo listing plummeted from 20 days in 2017 to just 13 days in 2018. “The market’s strong, and those who want new condos will pay for them – and will pay that significant premium,” Loschiavo said in an interview Friday. Low inventory continued to be a driving force in the market in 2018, she said, especially in Portland’s downtown area. Any property that came on the market at a competitive price was snapped up immediately. It wasn’t just the downtown area that saw a boost in activity, Loschiavo said. New demand surfaced in parts of the city that hadn’t seen significant condo construction in decades, such as East Bayside and Deering Center. Meanwhile, the downtown area had its most expensive condo sale that anyone can remember: $2.9 million for a penthouse unit under construction in the Hobson’s Landing development, on the site of the former Rufus Deering Lumber yard on Commercial Street. Condo developer Susan Morris, a principal at Portland-based NewHeight Group, expressed shock and amazement at how the market has grown since 2015, when she and her husband, Chip Newell, pursued one of the first Munjoy Hill residential redevelopment projects in recent years. “Every day, obviously, we are talking to ourselves about it and going, ‘Wow, what’s going on here? '” she said. According to Loschiavo, the surge in demand is being driven by three primary types of buyers: suburban retirees looking to downsize and go urban, millennials who prefer a high-density and walkable living environment, and out-of-staters coming to Portland for vacations, telecommuting or to open their own businesses. “A lot of them are used to urban living and don’t want to compromise on being on-peninsula,” she said about the latter group. Now that clear evidence of demand for condos has been established, Portland developers are practically falling over themselves to pump out as many new units as they can, as quickly as possible. Loschiavo said that between recently completed condos, projects under construction and those in various stages of planning, as many as 600 additional condo units could be added to the Portland market over the next two years. That amount of new supply dwarfs anything previously seen in the current real estate cycle. “I think developers have seen the demand, and so those who have opportunities are exercising them now,” she said. Loschiavo said it’s impossible to predict how the Portland condo market will perform in 2019, but she noted signs that it may be reaching a plateau. For example, 2018’s average price increase of 6 percent, while not insignificant, was far less than the 20 percent increase that occurred in 2017. Unit sales also dropped off slightly from 398 in 2017 to 388 in 2018. A handful of city policy changes also could affect the condo market, she said. They include a historic preservation proposal that would require new development on Munjoy Hill – a hot area for new condos – to adhere to architectural guidelines consistent with the existing neighborhood. A city-appointed committee also is reviewing how construction on Portland’s waterfront – another hot condo site – should be regulated in light of complaints about the impact of new development on the maritime industry. “Development is continuing to go further and further under the microscope on Munjoy Hill and at the working waterfront,” Loschiavo said. Jeff Levine, Portland’s director of planning and urban development, said the waterfront restrictions would not significantly curtail condo development because most developers seem to agree that new condos shouldn’t be built directly on the water. He said the Munjoy Hill restrictions and another requirement that larger condo projects contribute to affordable housing efforts are to ensure that new development is consistent with the city’s priorities and goals. Another change that could have implications for the sales of older condo units is the anticipated 10-year reassessment of property values for tax purposes in Portland. The process is expected to be completed in 2020 and may result in significant property tax increases in high-demand areas such as the West End and Munjoy Hill. “I think we may actually see some sales movement in that sector, because it may price some owners out of their units,” Loschiavo said. In general, Loschiavo expects older condos to play a bigger role in the market in 2019, as well as condos outside the high-priced downtown area. There are already signs that the roughly 50 percent premium charged for new units and the rising cost of construction have led to “price fatigue” among some buyers, she said. Newell, also a principal at NewHeight Group, believes that Portland’s condo construction boom is approaching the tail end. High construction and land costs already have put several city-approved condo projects on hold, he said, and those costs aren’t expected to come down again until the next recession hits. 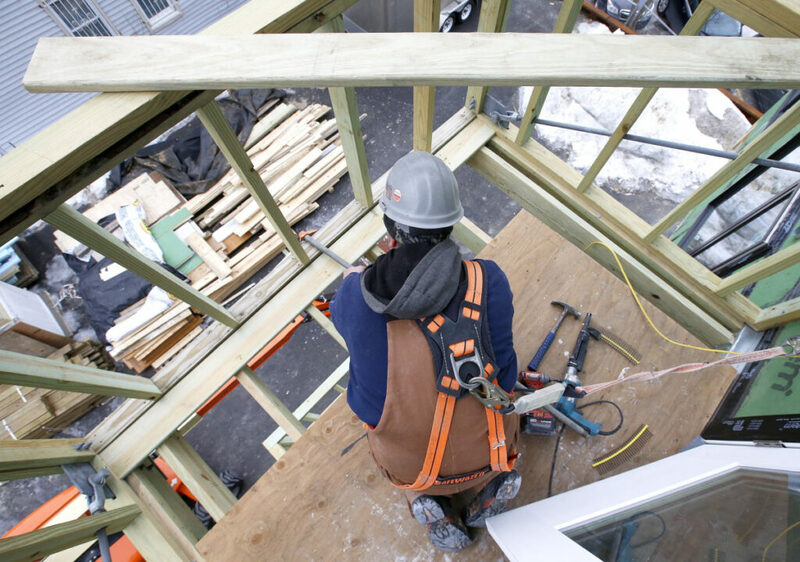 Newell warned that condo developers need to be selective about the projects they undertake if they want them to be economically viable, adding that some builders already have misjudged the value of their projects.